NORTH ATTLEBORO, Mass. – Locked in a defensive battle, the North Attleboro and Canton boys basketball teams spent the majority of the fourth quarter in a one-possession game. For the first seven minutes of the fourth quarter, only one minute of it was spent with Canton holding more than a one-possession lead. And for a three and a half minute stretch, neither side could make a move to either pull away or erase the deficit. North Attleboro senior Josh Montague converted a tough layup to bring the Rocketeers within three at 41-38 with just over four minutes left in the game. Canton had plenty of chances to pull away, but the Rocketeers wouldn’t allow it. Over the next three and a half minutes, Canton went 0-for-5 from the field, leaving the lead at just three points and the door open for the Rocketeers. But while Canton’s offense sputtered, its defense continued to force the Rocketeers into tough shots. North Attleboro didn’t fare any better in the stretch, going 0-for-3 from the field, missed the front end of a one-and-one, and had three turnovers. Despite the lack of success for North, it’s defense also kept them in the game, and the Rocketeers trailed by three the under a minute to go. It wasn’t until Canton forced a turnover off an inbounds play and with just under 20 seconds to go in the game, the Bulldogs turned to the man who had carried them virtually the entire game: senior Devin Foster. Foster made a cut through the lane and took a feed from Kyle Fitzgerald and laid it in for a five-point lead. And to seal the deal, Foster stepped in to take a charge on North’s next possession to get the ball back. With the 43-38 victory, Canton clinches sole possession of the Davenport division title. It marks the second straight year the Bulldogs have won the division. Foster’s last bucket was just the cherry on top of a terrific performance. 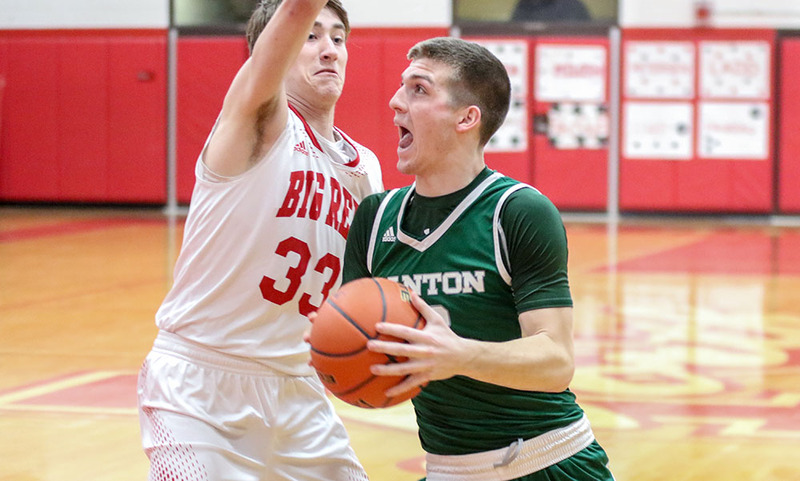 The senior guard scored all of Canton’s eight points in the final quarter, and accounted for 19 of the team’s 22 points in the second half. Foster finished with 29 points and five rebounds. North Attleboro’s offense came out strong, scoring 18 points in the opening quarter. But it fizzled from there as the Rocketeers managed just 20 points over the final three quarters, going just 2-for-18 from three point range for the game. The Rocketeers opened by hitting eight of their first 11 shots from the field but managed just six field goals on 31 attempts over the final 24 minutes. The teams combined for just 14 points in the second quarter. Sophomore George Ladd (10 points, nine rebounds) scored the first three points for the Rocketeers while Nate Gonsalves hit a pair of free throws. For Canton, Fitzgerald drained a three, Robbie Gallery added a free throw, and Foster scored four straight to get the Bulldogs within two, 23-21, at halftime. The Bulldogs seemed to make a concerted effort to get Foster the ball in the third quarter, and the senior delivered. After Fitzgerald hit a three to open the frame for the Bulldogs, Foster scored the next 11 for Canton. He followed Fitzgeralds three with a triple of his own and drove to the basket for two more for a 29-25 lead. Foster and North’s Jake Petersen traded two points apiece before Foster hit back-to-back shots for a 35-28 advantage, the largest lead of the night for Canton. Josh Porter and Montague connected on back-to-back chances to bring North Attleboro within three heading into the final quarter. Nate Gonsalves got North within two early and a pair of free throws from Joe MiloshCanton boys basketball (9-6 Hockomock, 11-8 overall) concludes its league schedule when it hosts Milford on Friday night. North Attleboro (6-9, 8-9) hits the road to take on Foxboro on the same night. Ryan Lanigan is the founder and Editor-in-Chief of HockomockSports.com. You can contact him at RyanLanigan@hockomocksports.com and follow him on Twitter at @R_Lanigan.